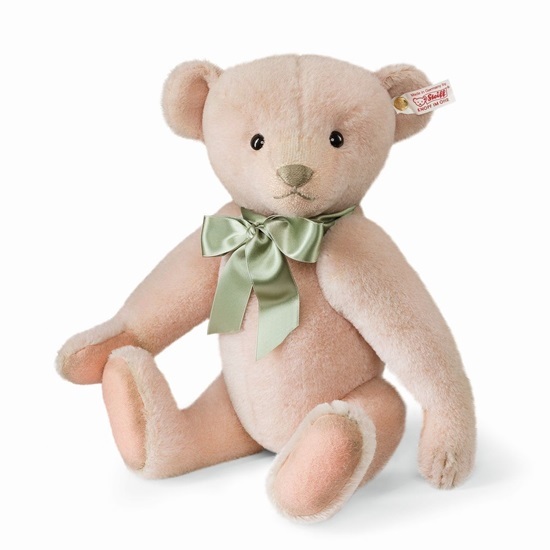 Made of a soft, pale rose colored alpaca, she is a limited edition of only 1500 pieces..
Lily Rose is a Limited Edition teddy bear of only 1500 pieces. She is made from a high quality pale pink alpaca and she has black safety eyes. Her nose and mouth are hand stitched with a light brown yarn. A green silk ribbon, tied in a bow, adorns her neck. She is 5 way jointed and surface washable. She comes with the white tag "Button in Ear" with the elephant motif.